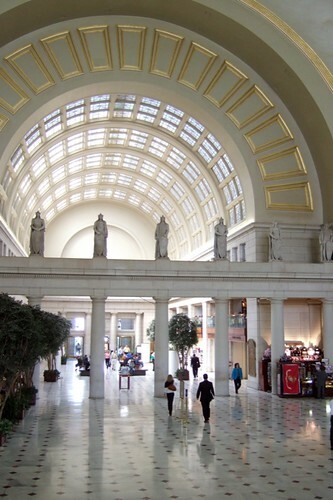 Photo: Union Station, Washington, D.C. If I had moved to London or Tokyo this past August—instead of to the Washington, D.C. area—soon after finding a place to live I would have given myself over to the city as a tourist. I would have walked the streets with eyes open and a glad step, ready to fall in love. I love most cities, and I love walking city streets. But for several prosaic reasons, these past weeks I have forgotten to give myself to Washington, D.C. I had good reasons, happy reasons to not be a tourist: a house search, family reunions, many friends to contact. Yet, as we were caught up in the mortgage process, dinners with friends, shopping for milk and bread, I felt a strong urge to walk the streets beyond Arlington, where we are staying temporarily, and beyond Alexandria, the location of our house (soon to be our house—knock wood, knock VA loan). 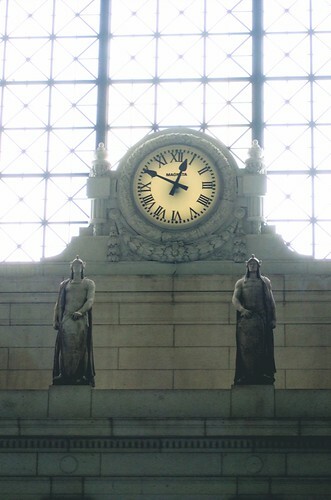 Last Wednesday a friend was taking the train back to New York from Union Station. I met her for lunch at a forgettable place in the station, saw her off after our meal, and then began the first guided walk from the book, Washington on Foot: 23 Walking Tours and Maps of Washington, D.C., Old Town Alexandria, and Takoma Park (fourth edition, eds. Protopappas and McNeal). Photo: Trolley waiting station near the Capitol (circa 1876). Tour 1 in the book starts at Union Station, heads through a park leading to the Capitol, past the Supreme Court building, the Library of Congress, the Folger Shakespeare Library, Frederick Douglass’s first Washington residence, up and down a few residential blocks on 3rd and 4th Streets, down a portion of North Carolina Avenue, and up New Jersey Avenue back to the Capitol. It was a completely beautiful day with no clouds in the sky and a cool breeze. As I walked along, stopping at places like the Capitol Grotto, a small red brick fountain with seats, I remembered to see the buildings. 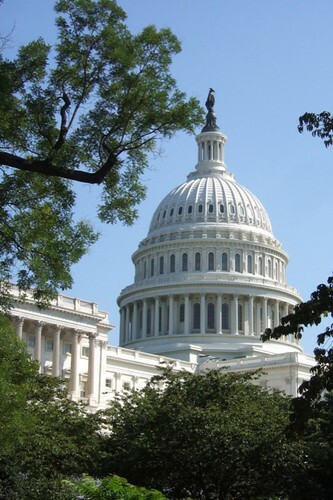 That is, most of the time the familiar shape of the Capitol dome represents the machinery of government, or the election, or other abstractions relating to power, ideals, and history. Instead, that day, the Capitol Building was a building and I was a tourist. I was free to enjoy the white stones, the columns, the physicality of the forms. 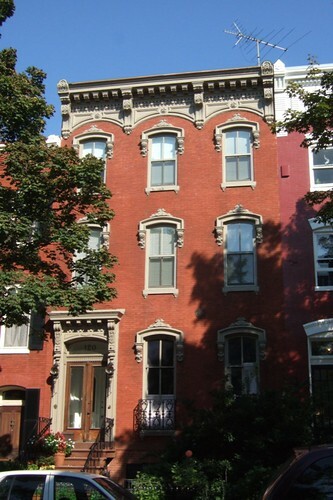 Photo: 120 4th St SE, a D.C. townhouse design from the 1870s. And I walked, admiring the “flat facade, elaborate cornices, and lintels” of a townhouse built in 1876. I passed renovated places, oozing respectability and the infection of black granite countertops in the kitchen. After a while, fussy facades started to meld together. I thought of heading home to make dinner. 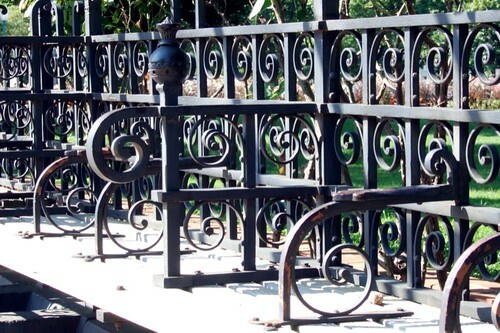 At a corner of New Jersey Avenue I stopped in front of a white townhouse with flaking paint and a yard with a wobbly fence. The small yard was dusty with small patches of trampled grass, worn away from outdoor parties. A collection of plastic and rusted metal chairs surrounded a pony keg fridge covered in bumper stickers. Arranged beneath a rooted but very bedraggled pine tree were a yellow plastic bat, a gray t-shirt, and a scattering of bottle caps. I framed some shots with my camera, but I couldn’t capture the exact pleasing wantonness of the scene. So I left it. With the dome looming overhead, I walked to the metro stop that would take me under the river to Virginia. So far, so good. Excellent photos and information! Looks like you’re getting into the D.C. thing.